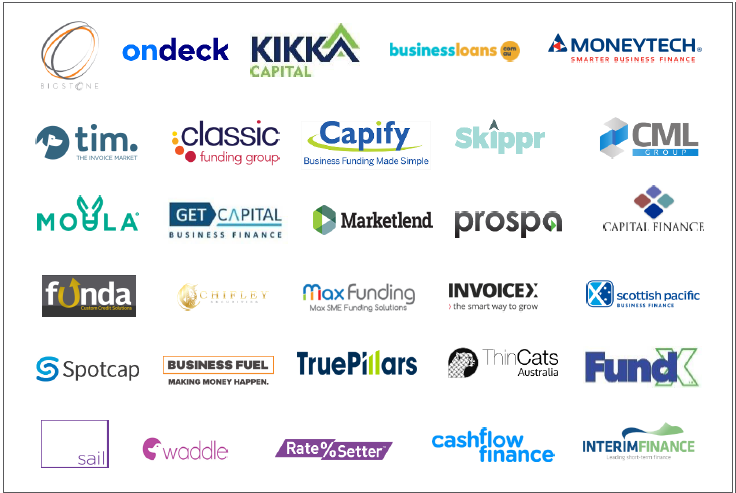 The SME Alternative Finance (AltFi) lending market is gaining momentum in the Australian market. We are lagging the US and UK markets by about 4 years, however the growth inflection point is near in the domestic market. There are opportunities for double digit yields on the debt, whilst supporting the backbone of the Australian Economy, SMEs. This piece provides an overview on the market. Fintech based lenders have emerged since the introduction of the peer to peer platform, Zopa, in the United Kingdom in 2005. Fintech lenders aim to reduce friction in the borrowing process for their customers, reducing the turnaround time from application to funding, and offering products which best suit the borrowing needs of the customer. Most offer risk based pricing to borrowers, which rewards customers with good credit records, rather than offering a single rate for all borrowers as is common in the banking sector. The enhanced user experience, superior pricing and tailored product aim to disrupt the lending businesses of the banking sector. SMEs have long been neglected by the banking sector in Australia. The amount of data required to assess the credit, application processing time and associated costs of processing has meant that the banks have pushed SMEs towards real estate backed loans. This does not suit the SMEs in many cases. Given the increased complexity of the credit assessment, SME loans have higher yields than consumer loans. SME AltFi lenders have now developed products that allow SMEs to borrow to match the duration of their funding needs, on an unsecured basis or secured against non-real estate business assets such as invoices or stock. Technology, in particular cloud accounting software and online access to bank account information, has enabled significantly faster credit assessments and reduced funding times for SMEs, opening up an underbanked market within the SME sector. The market opportunity is significant for Fintech enabled SME AltFi lenders. The main impediment to growth for Fintech enabled AltFi lenders is access to funds to lend to SME borrowers. Banks may be reluctant to fund these Fintech businesses at this point due to their lack of track record or ethical considerations due to perceived higher rates being charged by these lenders. This opens a yield play for investors and a new credit opportunity within the global debt markets. WHAT IS THE SME SECTOR? SMEs represent a significant sector within the Australian economy, from a total economic contribution basis, as well as an employment basis. There are 2 million SMEs currently employing 7+ million Australians (70% of the total Australian workforce). Since 2000, SME loans of less than $100,000 have grown at a slower rate than loans of greater than $2 million. Of the SMEs surveyed, more than 40% of the applications made by the smallest SMEs were rejected where the loans were for less than $100,000. Nearly one third (30%) of SMEs surveyed in the report felt they missed out on a business opportunity due to a lack of credit. Of the 37% of SMEs surveyed, the primary reason for having their loan applications rejected was due to the SME having a lack of collateral due to SME's trending towards service-based businesses. Bank requirements for owners of SMEs to post significant personal collateral for the business lend. Time required for the application process with the bank to be finalised and approved. Products not always matching the borrowing needs of the SME e.g. the duration of the loan may not match the SME's borrowing requirements where the bank requires the loan to be held for a minimum term with penalties imposed for early repayment. Banks have been unable to efficiently process the smaller end of the SME credit space as their current processes take time due to the manual nature of information collection and processing. This has led to banks focusing on larger businesses and larger loan sizes to give them the scale to make their lending business profitable. 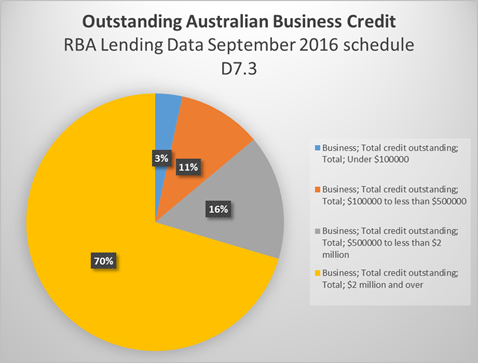 This is shown in the RBA business lending data in respect of APRA regulated entities (which would include the major Australian banks). Total lending activity for the year ended September 2016 in the banking sector for loan facilities under $2 million amounted to $A88.63 billion. This represents new loans approved for the year. The current outstanding balance as at the 30th September 2016 is reported to be $A912.43 billion. SME AltFi lenders have been set up to target the underbanked markets within the Australian business landscape to provide financing solutions to Australian SMEs. This is the current market that the AltFi SME lenders are targeting. The underbanked market includes businesses which have passed on potential growth opportunities due to difficulty in receiving finance, although not necessarily due to its bad credit, but potentially due to its lack of size, or where, from the business' perspective, there is a lack of human resources to complete the application process. New approaches to lending could tap into unmet demand for SME finance worth up to $70 billion (or a 9% increase in system business credit). The SME market (<$10m turnover) represents 38% of business banking profit. “We expect P2P SME lending growth to reach ~A$11.4 billion by 2020." "In our base case, we assume that P2P SME lending balances will grow from almost zero today to ~A$11.4 billion (~12% of the TAM) in 2020." "We factor in 2020 balances of ~A$15.2bn (~16% of the TAM) under our bull case and ~A$4.8 billion (~5% of the TAM) under the bear case. 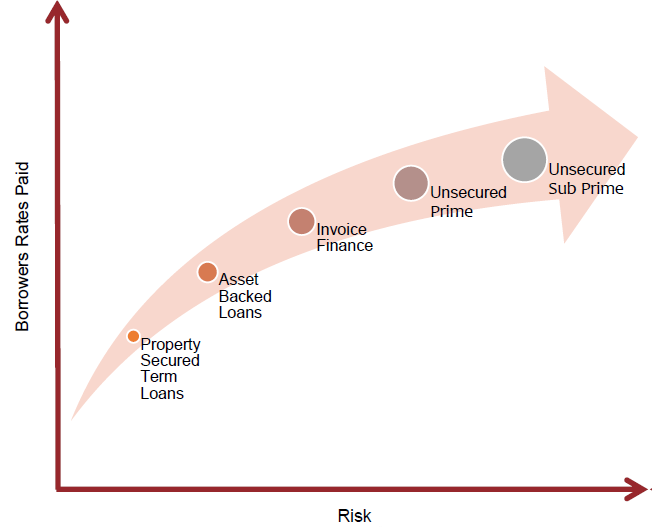 Lenders in the SME AltFi sector will predominately apply risk based pricing to their product set. Risk based pricing is simply pricing according to the risk of the lender, so a higher rate for a higher risk borrower, and a lower rate for a lower risk borrower. This pricing methodology is not used in the bank models, where rates are offered at each product type. Some lenders in the AltFi SME sector use technology applications to collect data from borrowers and monitor the financial health of the business on an ongoing basis, whilst the loan is still live. This allows the lender to have an insight into the ability of the counterparty to repay the loan on an ongoing basis. A further extension to this is the ability to work with the borrower on their forward cash flow projections and tailor funding solutions to the business. Lenders may use application programming interfaces (APIs) to plug into cloud based accounting software and bank accounts to share data and reduce much of the friction in the application process, saving time for the borrower and making borrowing funds a less manual and much smoother process. Originators in the invoice finance space will lend to an SME as either an advance on the value of an invoice where the invoice is used as collateral, or will purchase the invoices from the SME and run credit risk against the organization the invoice is issued against. This segment is a bank like loan where the lender will require specific assets (most commonly property or business assets) as collateral against the funds being lent. The differentiating factors between a Fintech lender and a bank is generally the ease of application and a risk based pricing benefit. Loans in the prime unsecured market are loans that are made to high quality borrowers or those that are most credit worthy and are not secured by any assets. These loans have the lowest probability of default in the unsecured segment, thus the rates are generally the lowest in the unsecured space. The borrower will benefit from a clean credit record. Near prime unsecured loans are a rung down from prime loans. The borrower may have had repayment issues in the past or a higher deemed risk due to a lack of credit history. Sub-prime unsecured loans are made to those borrowers who may have had difficulty maintaining a repayment schedule. These are the highest risk SMEs in the unsecured market segment and the risk is reflected in the highest rates charged in the market. The Australian SME AltFi market continues to grow in terms of volumes lent, as awareness of new funding alternatives become known to Australian SMEs. Whilst the banks focus on larger lends, Aura expect this sector to continue to grow. SMEs have greater choice in the funding landscape to support their growth, which is a positive for the wider Australian economy, and the 70% of the workforce that is employed by Australian SMEs. The current constraints for the industry are awareness of the lending products and the lenders and funding for the lenders. Please contact Brett Craig, Portfolio Manager at brett.craig@aura.co if you would like any more information. Brett is responsible for portfolio management and asset origination for the Aura High Yield SME Fund ((VIEW LINK). Prior to joining Aura, Brett held a number of roles at Macquarie Group, Australia’s largest investment bank over an 11 year period including Vice President role within the Debt Markets business where he focused on originating, structuring and distributing debt products primarily in the Australian market. Brett is renowned as the first portfolio manager to originate, structure, negotiate and execute an Australian Bank Debt facility for an AltFi lender. Prior to the Debt Markets role Brett ran the financial management of the equity derivatives and loans book for the Metals and Energy Capital business. Brett holds a B.Comm from The University of Wollongong and is also a Chartered Accountant. This document is dated June 2017 and has been issued by Aura Funds Management Pty Ltd (ABN 96 607 158 814, AFSL Authorised Representative no. 1233893 of Aura Capital Pty Ltd AFSL no. 366 230, ABN 48 143 700 887) This document is for information purposes only and does not constitute an offer or invitation for the subscription, purchase or transfer of units in Aura High Yield SME (Fund). Accordingly, this document does not constitute an information memorandum, prospectus, offer document or similar document in respect of units or the Fund. This document is only directed at persons who are wholesale clients within the meaning of the Corporations Act. This document may not be made available to any retail client. Neither this document nor anything contained herein nor any presentation in connection with this document shall form the basis of any contract or any obligation of any kind whatsoever.